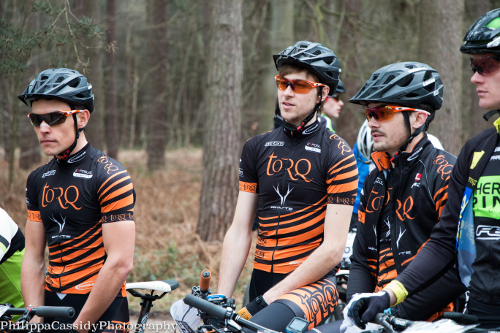 Just a week after the first round of the National XC Series (which for many of the team riders was their first race of the season), the team headed to Cannock Chase for Round 1 of the Midlands XC Series. Surprisingly, for a regional race, both the Men’s and Women’s Elite catagories boosted very strong fields, to also include some of the country’s top performing riders from the previous week’s National XC. 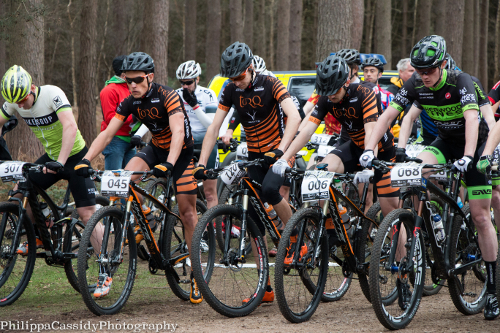 In the Men’s Elite race, Alex Welburn was the first TORQ rider home in 3rd place, behind winner on the day, TORQ Fuelled, Banjo Cycles Rider, Phil Pearce, with Chris Andrews and Lee Gratton both putting in strong performances – shortly behind Alex in 7th and 8th position. In the Women’s Elite race, Jules Toones finished seconds down on the race winner in 2nd place (despite losing significant time to a mechanical issue and an accidental detour off course). Jo Clay then beautifully balanced out the podium in 3rd, after a heavy week of training. Some great riding by the team and a good sign of their potential for the National XC at Newnham Park this coming weekend. Here is how the race went from the individual riders’ perspectives. Alex Welburn – With the pleasant change in the recent weather, this weekend was promising to be a dry race – much unlike the previous events of this Season so far; This made for some very fast racing, as the course rode well, with fast flowing single tracks and some short sharp climbs. I had a good start, leading the first 50 meters, before David Fletcher came past and lead the next ½ a lap or so, before I lost another place to Phillip Pearce. We then formed a group and over the next lap built up a significant gap on the rest of the field. By the start of the second lap, I lost touch with the pace of the two in front, as I found myself in the red trying to hold the pace. I decided to back off a bit, as I knew that I would pay for these efforts in the latter half of the race had I tried to hold onto the group. Over the next few laps, the gap then remained relatively consistent and I eventually crossed the line in 3rd, happy with the result and my form on the day. Chris Andrews – After Sherwood Pines, I was keen to see how my form was, especially heading into the second round of the National series – round 2 this weekend. A small but high quality Elite men’s category lined up for six laps of Cannock Chase’s finest natural single track. The whistle blew, we were off and sprinting hard! Suddenly my left foot became detached from my pedal. clunk. I quickly engaged and got back on the power again, albeit in last position heading into the first section of tight single trail. The relentless course coupled with the high speeds took its toll and small groups of riders began to form. Myself, Giles Drake and Tom Bell were riding hard. As we rode in tandem into the last section of twisty single track on lap 3, I got caught behind a back marker from another category and lost touch with Giles and Tom. I keep the pace high and did what I could to close the gaps back down. On the last lap, Lee Williams put in a fast charge and managed to bridge the gap to me and so we rode together. I felt confident I could hold him off. Heading into the final few corners, my front wheel washed out on a tight right hand corner. I had to un clip (banging my knee on the top tube in the process). The pain startled me as I rushed to get my bike upright and clip back in to my pedals. Lee was gone and so was sixth place. I was disappointed to finish seventh. I felt I had given a lot, but gained nothing. It wasn’t all doom and gloom though, I have some more valuable race miles under my belt and I’m feeling highly motivated for this weekend in Plymouth! Lee Gratton – For me, Cannock Chase is a special place. As a local to the course, I really love racing around the trails that I’ve been riding for years. The forecast looked gusty but dry for the race, so I stuck with the Schwalbe Rocket Ron-Thunderburt combination that did the trick in the challenging conditions at Sherwood Pines the previous week. One of the best things about riding so close to home, was the ease of riding up from my front door (as a warm up) and that all my family could come up to heckle (I mean support) me! I rode the course on my warm up and it was great! The guys at the Midlands XC did a sterling job, a nice mix of technical descending and sharp climbs to get your teeth into. The field was stacked! It was like a miniature National, but unlike a National, I was on the front row. Unfortunately for me (and my race), I made a bit of a hash of the start. My brain temporarily forgot where I left my pedals and by the time I sorted myself out, my front row advantage was gone. This mistake was made even more of an issue as the first half of the course was single track (so no hope of overtaking). Annoyingly, this was the part of the course that I had counted upon to allow me to hopefully build an advantage. That’s racing though. I got my head down and gave it all I had and came home in 8th. Overall not the result I was hoping for, but I can’t be too disappointed considering the standard of competitors. 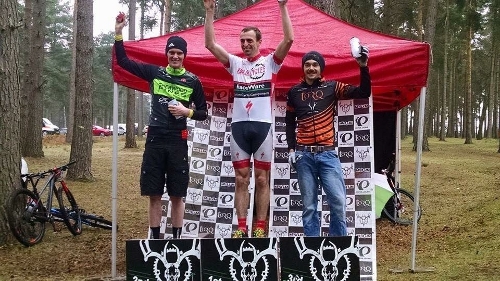 I feel like my form is good for early Season and, putting my mistake on the start aside, I rode well. Jo Clay – I have always enjoyed the Midlands XC Series as it always attracts riders from all over and is a really competitive series. The course at Cannock wasn’t easy, there were many wooded singletrack sections that sapped all the energy from you. The course also had some long drags that made you feel like you couldn’t even pedal a bike. On my practice lap, I was a little worried as I had only averaged 6.6 mph, so I knew I had a hard race on my hands. I thought to myself, if I stay smooth and push on where I can, I would hopefully pull out a decent result. As the gun set us off, Jules Toone was off the line like a rocket, I followed her wheel without trying to burn out before the first corner! 1st lap was going well with myself Lucy Allen and Jules close together. The traffic was not easy, as we had been set off closely behind the Vets, so were catching them thick and fast. As we approached lap 2, I hit more traffic and had a “come together” with one of the Junior boys, which took me off track for about 30 seconds. At this point Jules had caught me up and passed me. I got going again and tried to make up the time I had lost. I started to feel my legs getting a little heavy, this combined with the tricky wooded sections made my back start to hurt! I found myself trying to manage the discomfort a little and lost some more time. But by the fourth lap, I found a rhythm again and put in some good lap times. I ended the race in 3rd spot. I hoped for a bit better, but was still happy with 3rd. Luckily the weather stayed on our side and apart from the tough head and side winds we stayed dry! Jules Toone – The course was really fun! I really enjoyed it and was happy with my effort, although a little disappointed with a few problems which cost me the lead and possibly the win in this race. To be honest it was a pretty eventful race! In the first lap I had a good start, but missed a course marker and went haring off down the wrong trail, I somehow started to Follow The Dog and not the race course and lost a significant amount of time. I then worked hard to get my lead back. On the third lap, I got stuck in traffic on the sections with limited passing. Fourth lap, I was still holding on to my lead, then a small mechanical lost me some time. Fifth and final lap, I think I must have been trying too hard (to get my lead back again), because I had a little crash, though thankfully nothing serious. So it all added to the fun! It’s great to still have the Midlands XC Series! As at the end of last season, I think there was a little doubt over whether it would be run again? So a big thank you to the organisers for making it happen again for us this year. Thank you to Philippa Cassidy for the images in this report. As always a huge thank you to all of our team sponsors for their continued support.